Interview with Workboat.com about the new Sentry 32. Here Bob and Ian explain some of the key features of the new Sentry 32 to WorkBoat.com online editor Sam Pfeifle at the 2011 International Workboat Show. 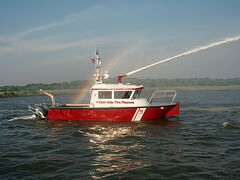 We are pleased to display three recent FireStorm Fireboat deliveres to new customers. A FireStorm 50 for the Camden NJ Fire Department, delivered in November 2011. A FireStorm 36 for the Canaveral FL Port Authority, delivered in Summer 2011. 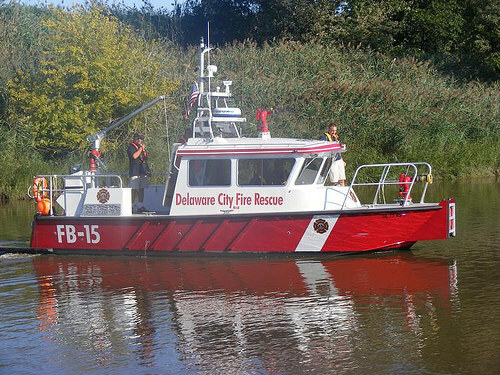 A FireStorm 30 for the City of Delaware DE Fire and Rescue, delivered in Summer 2011. Other CBRNE; Foam; Aft helm. A huge fire at Fire Island Pines, on Long Island NY, last night. The Fire Island Pines Fire Department was one of 22 area departments responding to a 9:15 p.m. call, according to police. Sources tell us that East Islip's FireStorm 30 fireboat attended and pumped for hours. Here's the Greater Kingston Chamber of Commerce press release from their annual President's Gala, featuring the 2011 Business Achievement Awards . Large Business of the Year: MetalCraft Marine. MetalCraft Marine designs and builds high-speed fire/rescue, patrol and workboats. They maintain their dominance and superior quality through a number of factors: constant innovation through R&D; strong relationships with customers — 90% of their business comes from referrals; and their enthusiasm for unique engineering. These factors enabled them to outperform the competition. MetalCraft has added 22 employees since 2008 and continues to add more employees every day. Since 2008, MetalCraft Marine has increased its sales by sixty-five percent. Bob Clark accepted the award. Interesting story from Cornelius, NC, who have a FireStorm 30 in service at their disposal. 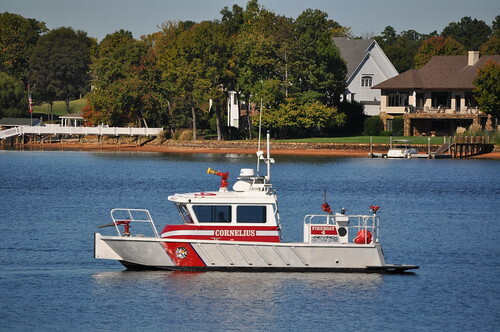 For the first time, Cornelius firefighters used a new fire boat to get the flames under control. The boat arrived on the scene shortly after the call came in, and firefighters then attached a hose to it and started pumping 2,400 gallons of water per minute onto the flames. "A fire this big overwhelms the domestic supply from the fire hydrants, so we use this -- a fire hydrant with an endless supply of water", Capt. Greg Shaner said. Watch the video; there's an excellent point about operating in very shallow water, which Cornelius' Fire Boat 4 is designed to do. Portland Fireboat Damaged In Mishap. Again. This from WMTW in Portland Maine on October 20th 2011. Too bad it wasn't a jet-powered fireboat. Portland's 2-year-old fireboat has sustained damage after striking an underwater object. Fire Chief Fred LaMontagne tells The Portland Press Herald that the accident happened last weekend while The City of Portland IV was on a navigational training run on the far side of Fort Gorges. It wasn't immediately clear what the vessel struck, but LaMontagne said the impact damaged a propeller and a rudder and sheared off a shaft. No one was hurt. It was the second time that the $32 million fireboat has been damaged since it was put into service a little more than two years ago. The vessel sustained $90,000 in damage and was out of commission for about three months after running aground in November 2009 in Whitehead Passage. 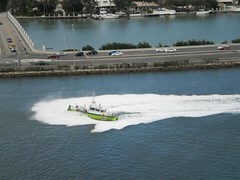 Patrol Boat-1 is our first ever electric powered patrol boat. It's designed and built the boat for the City of Annapolis' Harbormaster . The boat uses a Steyr hybrid diesel/electric engine that permits either electric power or, for higher speeds, diesel power. The propulsion is a Hamilton 213 waterjet . The jet can propel the boat in electric patrol mode at 4.5 knots, as it approaches and checks boats in the harbor ensuring anchoring permits are valid. To get to other areas of the expansive harbour the diesel propels the boat to 30 knots and recharges the batteries. The design challenge was how to provide enough battery power to meet the boat?s operational profile in such a small boat (23' X 8'6") and still be able to get on plane. MetalCraft designed the 48-volt battery pack, with high output solar assist panel array, around commercial off-the-shelf 31 series high amp hour batteries. This allows the Annapolis Harbourmaster to easily replace the batteries when they age. The batteries have a 4-6 year life expectancy. The total value of the eight batteries is $2,600.00. The estimated fuel savings is $550.00 per month. The reduction in overall engine maintenance is significant, including a major reduction in oil changes from 24 to 7.2 oil changes per year. This, added to 70% less engine wear, and the savings to operations start to add up. The speed penalty for the added weight of batteries and electric power system is approximately 4 knots in high speed diesel mode. MCM will be introducing additional models in the Kingston Electric Series and will introduce electric power systems in the Brunswick Sentry line in the near future. MetalCraft acknowledges and thanks the National Research Council of Canada and the Mid Atlantic Regional Air Management Association for their important contributions to this ground project. See also Annapolis harbormaster goes hybrid at hometownAnnapolis.com . We are pleased to announce that we are moving from our current location in Clayton, NY to a larger facility 15-miles West in Cape Vincent, NY. The new location is at the Anchor Marina on Route 12. We have been in Clayton, NY since 2007. We recently spent considerable time looking for larger facilities in Clayton area and we received great support from local officials. In the end we were unable to find suitable space on-water for launching our larger boats such as the FireStorm 70 and our new Sentry line of stealth patrol craft. We have been working with the State of New York to help with site upgrades and training for new staff. We expect to increase our upstate New York staff from the current 11 people to 15 to 18 people within a year. We will be hiring aluminum welders, metal fitters, mechanics, electricians and interior finishers. We currently have 87 employees in Kingston, Ontario. There is an interesting battle currently happening in Miami-Dade County. On one side, City officials who want to cut fireboat service to balance budgets. On the other, first-responders and citizens that maintain that Fireboats are great investments, and beware of false economies. Some good video on the subject. 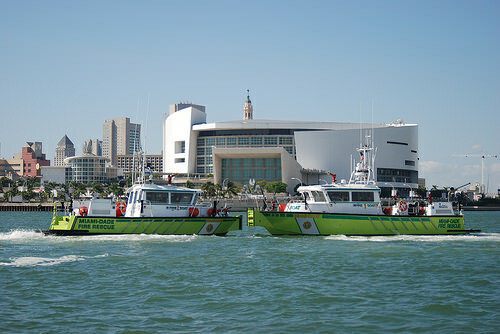 Disclosure: Miami-Dade County has two MetalCraft Marine fireboats. 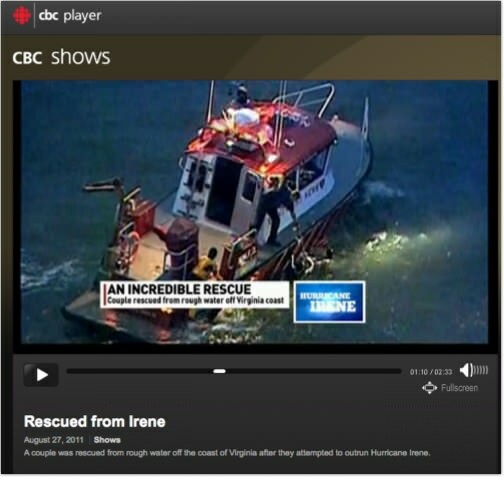 Virginia's Newport News Fire Department Marine Incident Response Team and their MetalCraft Marine FireStorm 30 is featured in this CBC News video about a couple (and their pet cat) aboard a small live-aboard sailboat who apparently tried to out-run hurricane Irene off the coast of Virginia. This incident, and its safe outcome for all, was widely reported by news networks and media across North America. Here's a nice article in Kingston This Week about the John S. Damrell, the FireStorm 70 soon to be delivered to the City of Boston Fire Department. Special thanks to Rob Mooy, Photo Editor at Kingston This Week, for the photos. "A monster," "far superior," "the biggest and the baddest." Meet MetalCraft Marine's latest fireboat, the FireStorm 70. The company based in the Kingston Marina, completed work on the FireStorm 70 three weeks ago, and will be sailing the 70-footer down to its purchasers in Boston later this month. On August 11, the Kingston crew took guests out for a test run near Kingston Marina, and the boat did not disappoint. "Boston has a number of fireboats but nothing with this capability. This can pump about 12,000 gallons per minute," says Jay Milner, account manager for MetalCraft Marine. 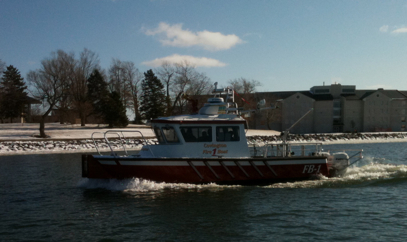 "The other fireboats Boston has are a lot slower. And the faster ones they have are very tiny, in comparison to this monster. It was a quick sell." 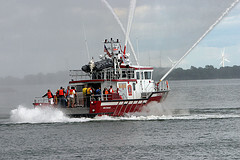 The City of Boston is purchasing the fireboat, equipped with chemical, biological and radiological emergency response capability, for the Boston Fire Department. It replaces their current fireboat "Firefighter," which has been in service since 1972 and does not have the capabilities needed for a modern emergency response fireboat. In a recent press release, Commissioner Roderick Fraser of the City of Boston said the FireStorm 70 will also have state of the art navigation systems as well as water jet propulsion, and is designed to operate in a chemical or biological contaminated environment. "This boat is light years ahead of the current fireboat and will greatly enhance our response capability anywhere in Boston Harbor," he said. "It's far superior to a fire truck because it's got a water supply that will never end, and manoeuverability," says Tom Wroe, President of MetalCraft Marine. The boat will be named John S. Damrell after the former Chief Engineer of the Boston Fire Department who battled Boston's Great Fire of 1872. It is the third 70-footer made by MetalCraft Marine. The first was sold to Tampa, FL, and the second to Jacksonville, FL. According to Milner, Kingston has been looking at buying a fireboat from MetalCraft Marine, but it is unlikely to be anything near of the size of the FireStorm 70, most likely it will in the 40-46 ft. range. "Kingston needs one of these," says Milner. "This boat can do 37 knots full tilt, it's just amazing." 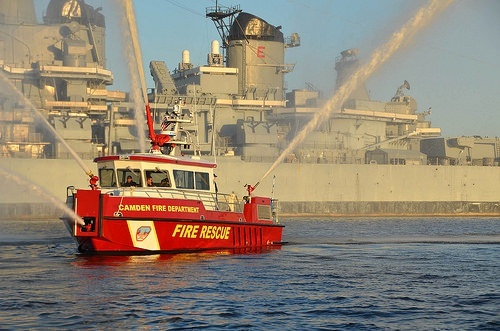 MetalCraft Marine has already begun work on their next project, a fireboat for Wilmington, Delaware. We have some good photos of some of the Kingston 30 Tow Boats commissioned by US Navy. These great boats were built by MetalCraft Marine US Inc. in Clayton, NY. The last boat in the contract just departed for for Virginia. Metalcraft Marine was recently awarded a contract by the United States Navy for the construction of eight of their tow boats. 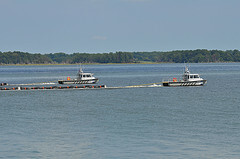 The tow boats will support the US Navy's spill recovery, support and salvage operations worldwide. Fully loaded the aluminium tow boat can reach speeds of 34 knots with its Single Iveco NEF 450 hp engine rated at 420 hp (309 kW) driving a single UltraJet 305HT High Thrust Waterjet viz a ZF 280 gearbox. UltraJet waterjets were chosen for their high bollard pull for vessel recovery. During sea trials bollard pull tests achieved 3800 lb. Thrust vectoring is with Ultra's Hydromechanical control system with a single helm lever and the hydraulic power-assist steering provides light and responsive directional control. Quinte Search And Rescue, a volunteer organization, celebrates it's gleaming new MetalCraft Marine Kingfisher 28 rescue boat. A gleaming new search and rescue vessel dedicated to improving the safety of boaters on the waters of the Bay of Quinte was unveiled by the volunteer members of Quinte Search And Rescue (QSAR). 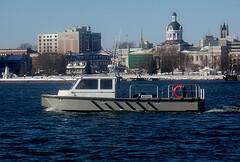 The vessel, an all-aluminum Kingfisher 29-foot (8.8-metre) craft built by MetalCraft Marine Incorporated, of Kingston, Ontario, and purchased with the help of a generous grant from the Ontario Trillium Foundation, is QSAR's first purpose-built rescue vessel. "This new vessel will assist members of QSAR in their response to emergencies and requests for assistance on the Bay of Quinte. The practice of safety on the water is paramount to enjoying recreational activities," Leona Dombrowsky, MPP, Prince Edward-Hastings, told community leaders gathered at a special ceremony August 12, 2011. 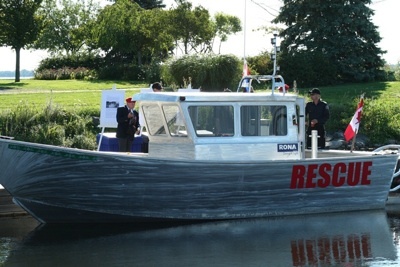 "This new rescue vessel will provide for a safer environment when we enjoy the waters of the beautiful Bay of Quinte. 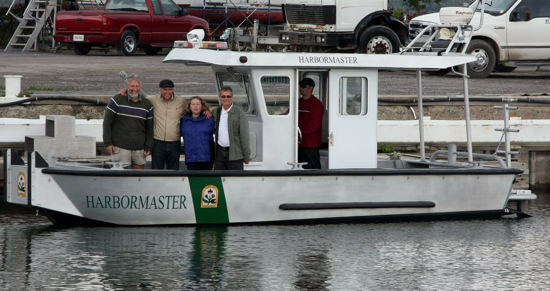 This new vessel will also be far more technologically advanced, which only helps the dedicated volunteers who do so much to help those enjoy the Bay Of Quinte safely," said MPP Lou Rinaldi of Northumberland-Quinte West. 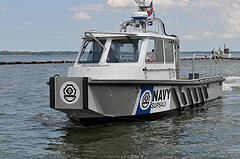 "With its all-weather capability and unique design, this new vessel not only improves our effectiveness as a rescue team but enhances the safety of the volunteers who put themselves at risk on the water," explained Howard Garrod, QSAR unit chairperson. "Making this boat a reality has been a true community effort," Garrod added. "We are very grateful to the Ontario Trillium Foundation for a capital grant, and to the individual and corporate donors who have helped us toward our goal." The new vessel was commemorated in the name of Lieutenant Colonel Bruce Albert Sutcliffe, DSO, a soldier from the Hastings and Prince Edward Regiment who died on the battlefield in World War II. Members of the regiment and two of Sutcliffe's surviving children took part in the commemoration ceremony. 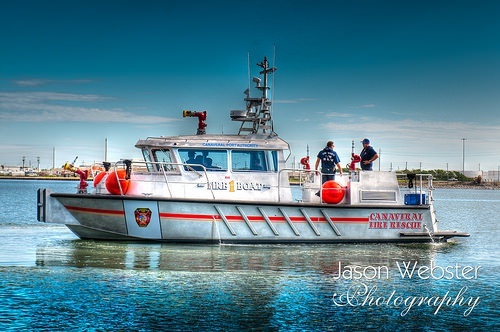 Established in 2005 and incorporated in 2008, QSAR is a community-based volunteer organization committed to providing timely marine search and rescue services in the region, and to promoting boating safety and accident prevention on the water. QSAR serves the communities along the Bay of Quinte -- Belleville, Quinte West, Napanee, the Tyendinaga Mohawk Territory, Deseronto, Prince Edward County and adjacent areas and waters. Check us out on Facebook (sign-in required). CBS UK has picked up the rights to Danger Coast . The reality show features the daily exploits and real life drama of the Miami-Dade Fire Rescue Marine Unit. The show airs in the 5:00 PM to 7:00 PM time slot on several UK channels and reportedly has 6 million viewers shortly after it commenced airing. We've just received these sweet photos of Miami-Dade County's FireStorm 50 making a spectacle of herself. Chief Chuck Norris and team from Covington, KY Fire Department took delivery of their new FireStorm 30 Sunday March 27th which will be stationed on the Ohio River across from Cincianti. MetalCraft Marine would like to welcome the newest addition to the Brunswick Commercial and Government Products (BCGP) and MetalCraft Marine (MCM) partnership, Kelly W. Webb . 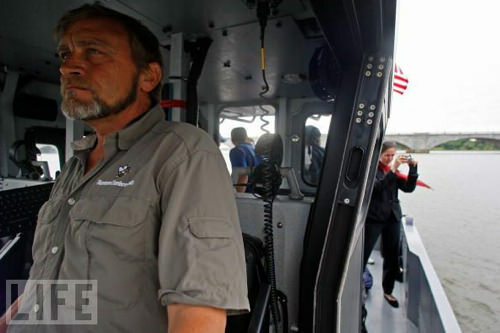 In addition to his experience with Aluminum Chambered Boats Inc. (ACB), Kelly brings his worldly background with the U.S Navy and the U.S Coast Guard, working for and with these organizations. Kelly's expertise is vast and he is a specialist in redefining how ergonomics improve the day-to-day effectiveness of marine operators. We are proud to have Kelly join the BGCP and MCM partnership.